Landaff Cheese from New Hampshire for sale. Buy online at Zingerman's Mail Order. Gourmet Gifts. Food Gifts. A farmhouse raw cow's milk cheese made by Deb and Doug Erb in the foothills of the White Mountains in Landaff, New Hampshire. Landaff is inspired by the late, great Chris Duckett's recipe for traditional Welsh Caerphilly. It's got a moist and crumbly texture, with an earthy, buttery flavor, enhanced by a natural rind created by the 3-4 months of aging at the cellars at Jasper Hill in Vermont. 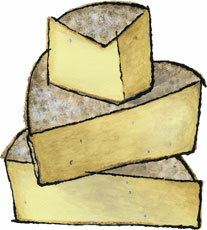 Landaff is a humble cheese so delicious you could easily eat a lot of it. As the Erbs say: "It's nothing fancy, but it works!" Our current wheels, made in July 2018, are wonderful. They have a yogurt tanginess with a nice, salty kick.